Detoxification is a delicate process that requires the balance of many factors for your physical and mental well-being; it should always be undertaken with professional supervision. Addiction to alcohol or chemical substances can leave your body depleted in stores of certain vitamins, minerals and important biological cofactors. Drugs can also damage cells, tissues and organs. An important part of your rehabilitation may be the right nutrients; specific vitamins and minerals may be a helpful part of the detoxification process. B vitamins play an extremely important role in nerve function, as well as tissue and organ function. According to the National Institutes for Health, B6 is needed for the formation of specific neurotransmitters, like serotonin and norepinephrine, which can be damaged due to specific drug habits. Vitamin B12 depletions can occur with nitrous oxide abuse. According to a study released in the "Journal of Medical Toxicology" in June 2006, chronic nitrous oxide inhalation is known to produce B12 deficiency. This deficit can lead to psychosis, which the study states vitamin B12 supplementation helped to reverse. 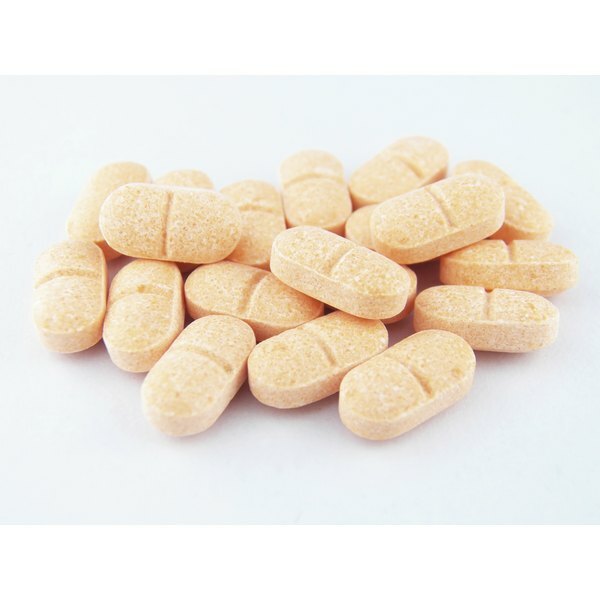 Talk to your doctor about your potential B vitamin needs, as too high a dose of any B vitamin can be detrimental. As an antioxidant, vitamin C, also known as ascorbic acid, can help reduce damage from free radicals, which can affect organs, cells and tissues. The National Institutes of Health state that vitamin C is also needed for collagen in bones, cartilage, muscle and blood vessels and it aids in the absorption of iron. According to a study published in "Behavioral Pharmacology" in December 2007, free radicals play a role in physical dependence on opioids. The use of antioxidant substances, like vitamin C, were found to attenuate the expression of physical dependence on these drugs. Discuss the use of vitamin C with your doctor before beginning supplementation. Famous for its function in bone formation, calcium is an important part of a healthy body. Potassium is also needed for bone structure as well as muscle function. Prolonged use of heroin may potentially decrease calcium stores, while opium can lower potassium. A May 2010 study published in the "American Journal of Drug and Alcohol Abuse" investigated the effects of opium and heroin on calcium, potassium, cholesterol levels and other parameters. The study found that levels of calcium were lower in the group that used heroin. Likewise, potassium was lower in the group that used opium. If you are withdrawing from either of these types of substances, consult your doctor about using calcium and potassium. Chronic cocaine use is linked with lower levels of a brain chemical, or neurotransmitter, called glutamate. Glutamate is your body's main excitatory neurotransmitter, and is involved in memory and focus. In December 2009, "Psychiatry Research" featured a study that discussed cocaine's effects on the brain. The study concluded that glutamate levels were significantly lower in chronic cocaine users than in controls. Glutamate levels can be increased through supplementation with L-glutamine. Because glutamate is an excitatory neurotransmitter, increasing it can induce excitation. Talk to your doctor before supplementing with L-glutamine to determine whether or not it is right for your specific case.